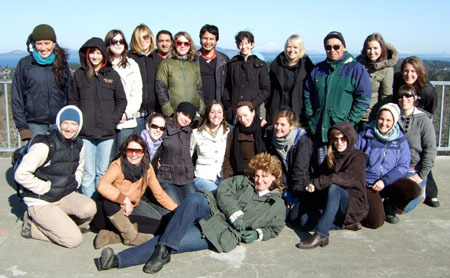 Using a "sand box", at http://es481.geog.uvic.ca, the students collected information and mapped dozens of sites, all revolving around themes of sustainability and restoration. The Community Mapping Collaboratory assisted the Dr. Beckwith and her students with technical help, cartographic guidance and by hosting the sand box. The results were fantastic! 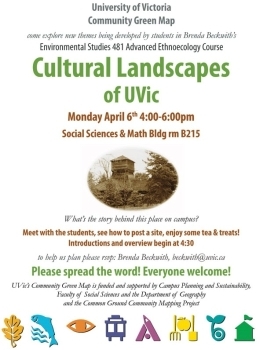 We hope to have the new map sites added to the UVic Green Map as soon as possible. Below is the invite to the Launch Event. Attending were representatives from Common Ground Community Mapping Project, UVic Computer Science, the UVic Library, and UVic Environmental Studies. Click image to see a large image of the invite.